Tyesha Dwight-Higgin, the first UD McNair Scholar to go on to earn a doctorate, addresses the program's annual dinner and celebration. 2:45 p.m., Aug. 21, 2008--The University of Delaware's Ronald E. McNair Scholars Program has become synonymous with helping its students achieve success in pursuing and completing a graduate school education. 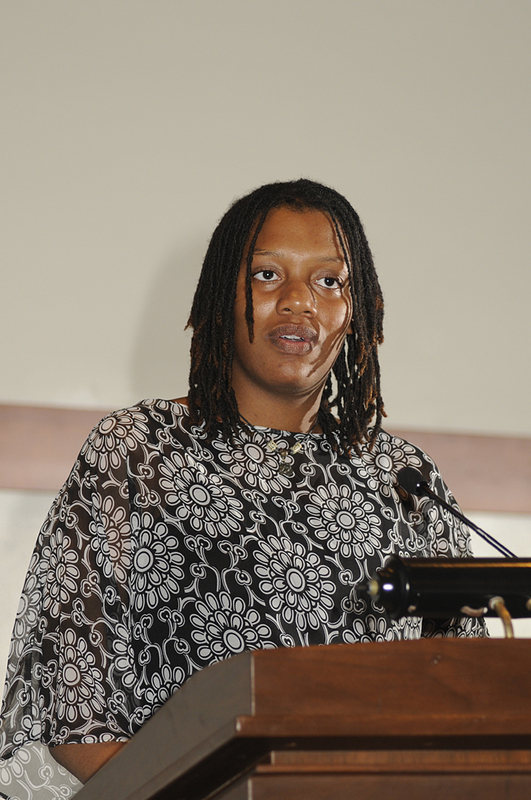 On Aug. 14, Tyesha Dwight-Higgin, the first McNair program participant to complete doctoral studies at UD, gave the keynote address to more than 150 students, parents, program faculty mentors and guests during the ninth annual McNair and University Scholars Achievement and Celebration Dinner, held in Clayton Hall. The Ronald E. McNair Scholars Program honors the African-American astronaut who died in the explosion of the Challenger space shuttle in 1986. Modeled on the McNair Program, the UD Undergraduate Scholars Program helps students from diverse and disadvantaged backgrounds to get into graduate programs of their choice and obtain funding. Born in East Orange, N.J., and the first member of her family to complete baccalaureate and doctoral degrees, Dwight-Higgin recalled what it was like to embark on an academic career in a new town and a new state as she began her studies at UD. A biological sciences major who graduated from UD in 2005, Dwight-Higgin participated in both the NUCLEUS program and the Student Support Services Program. She also received a scholarship to participate in a UD Study Abroad program in South Africa, and was a John Henry Taylor Scholar and a Science and Engineer Scholar. An important part of her undergraduate experience, Dwight-Higgin said, was working with John Scholz, professor of physical therapy in the UD's Motor Control Laboratory, and Dr. Bull Anthony, in the biomechanics lab of Imperial College in London. Celebrating the McNair Scholars team award are, from left, Yianna Antonopoulos, Lorraine Makone, Timothy Kim, Lynnette Overby, professor of theatre and director of the Undergraduate Research Program, Janoah Wynn and Maria Ayllon. The McNair celebration dinner also was an opportunity to showcase the 17 program graduates for 2008, and the graduate schools they will be attending, including the University of Delaware. Palacas said that this year's class of 28 McNair and University Undergraduate scholars was chosen from among about 180 applicants. Program participants are involved in a wide range of activities, including workshops, community service projects such as rebuilding a home in New Orleans, and fun events like whitewater rafting and trips to New York City and Jamestown, Va.
Each year, participating faculty mentors in the McNair program are nominated by students for the mentor of the year award. Beginning this year, the award is named for the late Juan A. Villamarin, professor emeritus of anthropology, who was an enthusiastic supporter of the McNair and University Undergraduate Scholars Programs. The first Juan A. Villamarin Mentor of the Year Award was presented to Ulhas Naik, professor of biological sciences. 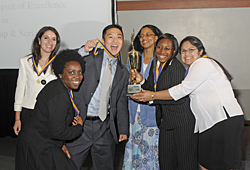 • Team Award: Maria Ayllon, Janoah Wynn, Yianna Antonopoulos, Timothy Kim and Lorraine Makone. • Oral Presenters: Arline Wilson, first place; Evanna Singh, second place, Matthew Stieglitz, third place.